21 Days in Africa is a real-life adventure story that recounts the author's experience of hunting wild game in Africa. 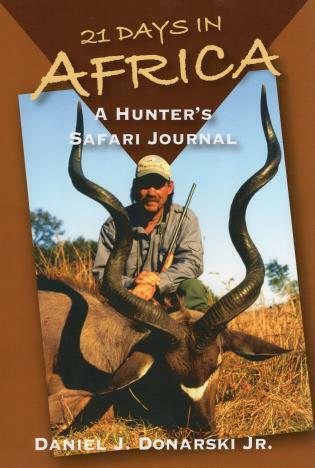 It contains helpful suggestions for planning your own African safari, with tips on rifle and bullet selection, travel insurance, clothing, and presafari preparations, including physical fitness and filling out the numerous required forms. "Too many people believe that Africa is all gone, particularly South Africa," writes Donarski. "It is not." And through his words and photos, he shows today's Africa, from the big city of Johannesburg to the Zulu village of Wasbank. Daniel J. Donarski Jr. is a retired Army major who writes about hunting, fishing, and travel for newspapers and magazines. His writing about being in Africa has appeared in Sports Afield. He lives in Sault Ste. Marie, Michigan.